Posted on 08 January 2013. President Michael Sata has urged the Zambia Security Intelligence Service (ZSIS) to adopt proactive measures and boost the efforts of other law enforcement agencies in fighting corruption. Addressing the ZSIS senior officers’ conference yesterday, President Sata noted that the problem of corruption can be a hindrance to national development as public resources are susceptible to abuse by public officers. “In this connection, my government will not relent in fighting the scourge as failure to do so could undermine economic development,” the Head of State said. 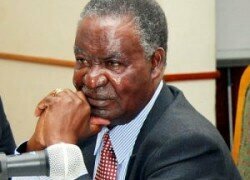 President Sata also urged the intelligence to not only continue monitoring the activities of subversive elements, but also take decisive measures as provided for in the Zambia Security Intelligence Service (ZSIS) Act. “I expect the service to focus its energies on ensuring that national interests prevail over individual interests and should serve as a basis for the formulation of appropriate strategies that will direct the operations of the service in 2013” the President said. The President said he was confident that the intelligence service is focussing its operations in line with the PF Government’s policies. And ZSIS Director General Mr. Martin Mwanambale pledged the intelligence service’s total loyalty to the Head of State, the Government and the people of Zambia.